My co-judge Jan and me, selfie-style on a very hot and humid show-day. Our task; judge over 150 entrants in the Old Saybrook Arts and Crafts Festival. 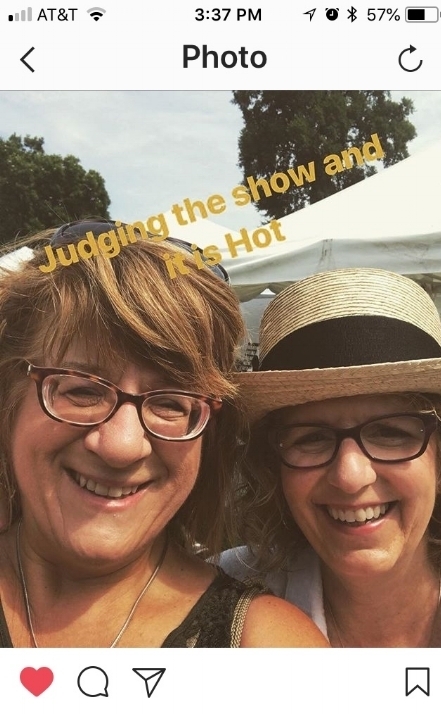 Saturday a week ago, I had the pleasure of of being invited along with another dear artist friend of mine, Jan Blencowe - to be the co-judges of the Arts and Crafts Festival in Old Saybrook, CT. We took our task very seriously, having been in that spot 'on the other side' for many, many years. There were roughly about 150 entrants/booths of artists and crafters of all types. We were to choose a "Best of Show" for the Fine Arts, as well as a "Best of Show" for the Crafts. Within each category were subcategories of various media; oils, acrylics, watercolors, mixed media, photography, graphic arts/illustration for the fine arts. Categories such as wood-working, metal-work, glass, 'consumables', 'embellished arts', fiber arts, and jewelry, made up the Crafts part of the show. We were given lists of all the entrants grouped by what category they came under (and I think there were probably eight pages in total). Each artist or crafter had been given a packet by the show organizers with information, a card with their booth number and name on it, a large orange (for artists) or green (for crafters) sticker - to indicate the one piece they wanted judged. Most of the entrants read the instructions, and complied, but oh so many did not! Several did not hang their booth number on their tent, so we had to double check who they were, so we could assure that we had indeed seen every single entrant. Many, did not indicate which piece they wanted judged...so we had to ask, and explain what that 'sticker' was all about! Several entrants, on finding this out, asked, "Oh, can you come back in five or ten minutes?" - No, was our answer- there are just too many entrants to back-track on this blistering hot day! We advised them to choose their best, most fabulous work for us to consider! Once we requested that, most were able to jump right in with their most treasured piece. But I do recall one entrant who shyly wanted to decline, saying, "oh, but I'm 'just a bead-stringer'". Lord, I wanted to take her by the shoulders and let her know to be proud of her work! She is a human making fabulous magic for someone else to love! My co-judge and I visited each and every booth together, pointing out things that were interesting or extraordinary to each other, making notes on works that we thought significant. It took several hours to go through all the entrants, then we went back to check on several that we had questions on. Finally, we met in a quiet, private area to discuss what we had seen and our thoughts on the overall show. We chose our 'Best of Show' in both sections (Arts vs. Crafts) first. Then we set about going through each sub-category to determine the 'First Place Award' within each designated section. We had each taken a lot of notes, indicating strengths of the various entries. There were some really strong works out there that had made big impressions on us both - that made some of the choices quite easy. In some categories there were some harder choices to make, so we discussed from our notes, what we had seen about the artisans' technique, presentation, and wow-factor of the piece (that thing/quality that set it apart from their peers). After having done these outdoor shows for many years in my past, I do remember that many times you have no idea the judges have even looked at your booth or your work. So usually, as an artist, we never had a chance to interact with the judges. But - whether you do or don't, I've put together some advice that might be helpful to you! - Always, read the instructions in your information package that the show organizers give you! - Have your booth and items arranged to best display your finest show stopping piece as well as your other pieces (most creatives do this quite well!). You want it easy for everyone to see your items. As judges, we aren't going to interrupt your sales or interactions with your collectors (but it's helpful for us if your booth is marked and item you'd like considered for judging marked). - Take PRIDE in your work - that's why you are in this as a creative - you have something amazing to share with the world. Never speak of yourself as 'less than'. - If the judges do ask about your work, have your 'elevator speech' (ie- brief and clear) about why this piece is special - do you use an unusual technique, incredible or rare materials, does it require a skill that has taken years to master, or has an emotional back-story? Keep things succinct at this point, if they want more info, they'll be asking you, "please, tell me more!". But unless requested keep it short, judges have a lot of territory to cover in a given amount of time. - Take care in presentation of your work - especially if it is framed work! Do the corners meet? Are there dinks and knicks in the framing? If there is unusual framing, some of that cool effect is lost when there is poor workmanship in the way this is put together (ie, quarter inch gap in one corner where bound edge doesn't quite meet). It can really detract from a stellar painting or photo. - We found some artists don't realize where their true strengths are! Are you currently in love with your most recent work, when perhaps there is an older piece that may be stronger? If you are being asked to present just one piece for judging, make sure it's your strongest! Whether you're in a small local show, big regional show, or a huge national show, keeping these things in mind will certainly help. But most important - keep doing what you do best! Make that wonderful thing that you are meant to share with the world! Lucky collectors will find and connect with you whether you are awarded recognition or not. Know that on any given day, at any given show, you will be presenting with many others who have stellar creations, too. Yes, judging an art show is hard, but what an honor to reward those outstanding creations!